Recently I told an intern, in this industry people either love it, or they run away and never look back. For those of us who are crazy enough to stay in the international side of business, we are fortunate to never have the same day twice. Our days are filled with exciting opportunities to find solutions and deal with the most unusual circumstances. Most of the time, I avoid telling family and friends stories, because it is too hard to explain unless they have similar roles. The MGTA at times works not just as a fantastic resource for nearly everything related to importing or exporting, but it also serves as a therapy session. You can attend an event or seminar and find someone who has or is experiencing similar issues. Usually, they may just feel sorry for you and say I am glad it is not me this time, but at least they will listen. I encourage you to look at the upcoming MGTA events and find your next therapy session. Elizabeth Chiavetta is the Director of Audit Policy within Regulatory Audit where she is responsible for overseeing the policies and procedures followed by auditors in performing audits, continuing professional education programs, and quality assurance to ensure compliance with Government Auditing Standards. Ms. Chiavetta started with CBP in October 2008 as an auditor within the Audit Policy Division and was promoted to the Policy Branch Chief in July 2010 and to Director in October 2012. Prior to joining CBP, Ms. Chiavetta worked as an auditor for the Defense Contract Audit Agency within the Department of Defense. Ms. Chiavetta graduated from the University at Buffalo with a BS in Business Administration with concentrations in Accounting and Finance. Paul Vinkler is an Assistant Field Director with the Customs and Border Protection (CBP), Office of Regulatory Audit, Chicago Field Office. He has been with CBP for nineteen years. As an Assistant Field Director, he manages and supervises auditors who conduct various types of audit for CBP ranging from Focused Assessment to Airline User Fee Audits. Prior to becoming an Assistant Field Director in 2003, Paul was an auditor for CBP. Paul attended Indiana University in Bloomington, Indiana where he received his Bachelor's of Science degree in Accounting. Paul also passed the Certified Public Accountant exam in May 2000. If you are an importer, you are subject to an audit by the U.S. Customs and Borders Protection. CBP prefers to refer to these audits as Focused Assessments or “FA.” The FA is a risk-based auditing approach the agency has had in place since 2001 and it is long overdue for a makeover. CBP has announced that it is updating the process and making a few changes. Ms. Elizabeth Chiavetta, Director, Audit Policy at Customs Headquarters in Washington, D.C. will be joining us at this program to discuss the Focused Assessment process and the revamping of the program. She will be joined by a Paul Vinkler, an Assistant Field Director with the Customs and Border Protection (CBP), Office of Regulatory Audit, Chicago Field Office. The prospect of an audit is never a pleasant thought. Preparation, however, is key. That preparation starts with understanding the Focused Assessment process. Preparation also involves alerting your company to the seriousness of the Focused Assessment process and the importance of supporting trade compliance. Because of this, we invite you to bring your manager with you. According to the 25th Annual State of Logistics Report released at the end of June, which was compiled by analyst Rosalyn Wilson and sponsored by Penske Logistics and the Council of Supply Chain Management Professionals (CSCMP), 2014 is predicted to be “the best year in the past eight for freight transportation providers.” That would be welcome news if not for the whiplash effect it’s having on logistics management professionals as well as the transportation providers who are trying to balance their available capacity with uneven surges in demand. Rail transport costs rose 4.9 percent in 2013, with Class 1 freight revenue per ton-mile rising 5.3 percent. Overall rail traffic was up 9.2 percent. These are better than good growth numbers for this time of year, and are even more impressive when you consider what carriers went through in the first quarter as they endured one of the worst winters in years. One prescient for this is the ability of the railroads to truly leverage its strengths in terms of ever-improving service quality. Due to these improvements, more shippers have jumped on board. In turn, the carriers have leveraged these excellent returns and have reinvested into their networks and infrastructure to expand, upgrade, and enhance the U.S. freight rail. Earlier this year, the Association of American Railroads (AAR) said that the seven North American-based Class I railroads plan to invest roughly $26 billion in 2014, adding that since 1980 freight railroads have anted up about $550 billion into their rail networks – with roughly $115 billion alone being invested over the last five years. Cost of water transport rose 4.5 percent, reversing the previous year’s downward slide. Ocean carriage is “slowly improving” despite additional capacity. Five trends to follow over the next 4 months: first, larger vessels allowing carriers to maximize efficiencies and therefore lower per container expenditures by up to 35% has led to an industry-wide push to go bigger. Second, slow-steaming has become the new norm — thus reducing fuel consumption by 53 percent and minimizing carbon footprints. Third, bigger vessels and slow-steaming may further strain seaports due to more concentrated, intermittent shipments at a time when overcapacity is a concern. By expanding berths, utilizing on-dock labor more proficiently, and investing in new cranes and automated operating systems, terminals can go a long way towards boosting productivity and expediting the flow of goods. Fourth, carrier alliances are reconfiguring supply chains as it allows steamship lines to further control costs by sharing vessels 2nd port facilities. Lastly, larger vessels and carrier alliances suggest fewer ships in the water and less frequent port calls. This means that the winners will be those industrial corridors with excellent connectivity to inland ports and those seaports able to quickly off-load cargo. On the industrial real estate front, international consulting firm JLL believes that Atlanta & Baltimore will be notable beneficiaries. Airfreight revenue was unchanged in 2013, even though overall revenue tons carried by air fell 0.7 percent. The latest figures from the International Air Transport Association (IATA) for April indicate that while the freight market improved 3.2 percent above previous year levels, demand has not. Traffic levels in April were slightly below those of January and 1.1 percent lower than what was recorded in March. IATA indicated that European airlines saw demand for air cargo fall by 0.7 percent compared to April 2013, making a slower start for carriers as they entered second quarter – particularly as GDP growth in the Eurozone was just 0.2 percent in the first quarter. However, a slightly different and more encouraging story for airfreight seems to be playing out in Asia, where preliminary traffic figures for the month of April showed some growth in international cargo markets. This said, the international freight load factor averaged 64.3 percent in April, 0.4 percentage points lower than the same month last year. Analyst Rosalyn Wilson notes that passenger jets are carrying growing volumes of cargo in their bellies, taking market share from cargo freighters. According to her, belly cargo in passenger planes is very profitable, estimated at close to 65 percent, so passenger airlines have been pursuing it more aggressively. (*) This article is based on the 25th Annual State of Logistics Report published in the July 2014 issue of Logistics Management. A few weeks ago, as part of the Beyond the Border Initiative, Canada amended its Customs Self-Assessment (CSA) program to include Non-Resident Importers (NRIs). Previously, to participate in the CSA program, importers had to reside in Canada or, in the case of corporations, have their head office in Canada or operate a branch office in Canada. The amendment extends to importers, who ordinarily reside in, or have their head office or operate a branch office in the U.S., the same benefits afforded to CSA authorized importers by allowing them to apply for membership to the CSA program. They are willing to provide their senior management authorization that their books and records contain or will contain commercial business processes, customs interfaces and internal control procedures. These amendments will not affect CSA-authorized carriers as they are not subject to this residency stipulation. A carrier is eligible for CSA authorization if it has its head office in Canada or the U.S. or operates a branch office in Canada or the U.S. In the May-June edition of the World Trader newsletter, I wrote an overview of the International Longshore and Warehouse Union (ILWU) and the Pacific Maritime Association (PMA) labor contract negotiation topics and expectations. The ILWU represents the Longshore labor working all U.S. West Coast container and bulk ports and the PMA represents the port terminal operators and steamship lines calling U.S. West Coast ports. At stake is 68% of all U.S. containerized import shipments as well as U.S. West Coast containerized export and bulk shipments. At the time that article was written we were a few short days from both sides sitting down at the negotiation table. Expectations from thousands of Transpacific importers and exporters at that point were the two sides would come to an agreement by early July. Fast forward to August 20 — and the two sides still have not reached a contract agreement. All, indications are that both sides have been diligently negotiating but confidentiality agreements have prevented any status updates leaking to industry news outlets. Progress has been limited to some degree due to several interruptions including vacations, Teamster picket lines in LAX/LGB ports intended to draw support from the ILWU rank and file resulting in a cooling off period negotiated by the LA Mayor and several breaks so the ILWU can attend to separate labor negotiations with the Pacific Northwest grain handlers. Unlike past contract negotiations where the ILWU would agree to a contract extension and continue working after expiration of the current contract, the ILWU currently is working without a contract. The risk of working without a contract is that no contractual arbitration mechanism is in place to order the ILWU back to work in the event the work stoppage was determined to be non bona fide. One of the major topics resulting from the new Affordable Healthcare act is the imposition of a “Cadillac tax” on the ILWU’s generous medical plan, which is projected to cost $150 million annually. Neither side seems willing to compromise on this topic. If progress is not made on this issue soon, there is a good chance this topic will be excluded from negotiations resulting in a short three-year contract before the beginning of this Cadillac tax in 2018. 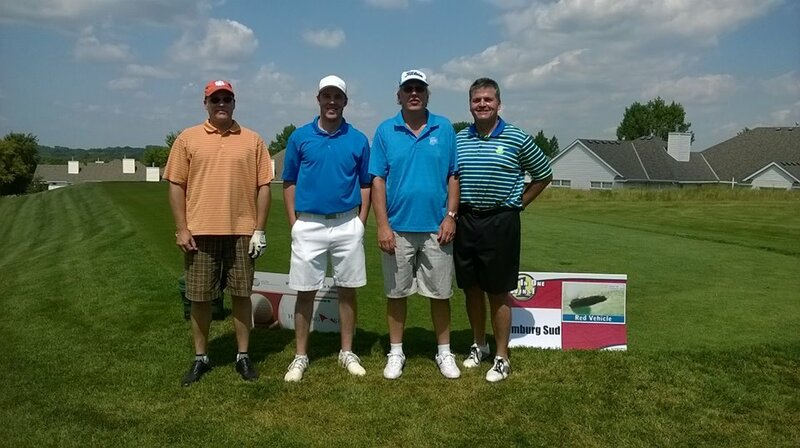 This year’s MGTA golf event took place on a beautiful Summer Day and gathered 137 registered players, the most we have had over the past 7 years. One has to wonder whether the weather played any role in the great turnout that we had this year. Or was it all pure dedication to this great organization of ours? Either way, we would like to extend a BIG thanks to all of you MGTA members and guests who signed up for the tournament, to Crystal Golf Course for doing everything in their power to make this a great experience for everyone, for the sponsors whose support is essential to the overall success of this event and to all of our volunteers without whom we could not have made this tournament happen. By the way, I did not get a chance to play this year but my fellow co-worker, recruiter extraordinaire Andy Stahlman, did — he and his teammates (which included Communications Committee member Kevin Johnson from Best Buy) actually won 2nd place in the tournament. Not too shabby for a first time appearance, if you ask me! The fifth largest country in the Americas by area, Mexico is the third largest trading partner of the US, with over $506 billion in bilateral trade during 2013. The signing of NAFTA and other trade agreements has contributed to a rebound in the Mexican economy since hyperinflation in the early 1990’s caused contraction of the economy by nearly 7%. Between 1993 and 2002, trade with the US and Canada increased by 183% and 165% respectively, with even larger gains from trade with Chile, Costa Rica and Honduras. Despite the growth of the economy, endemic corruption and the Mexican Drug War present a challenge for growth as they discourage trade. In 2012, Mexico’s GDP in purchasing power parity was estimated at $1.75 trillion, the fifth largest of the emerging markets. Unemployment is relatively low by international standards, estimated at 4.9% in 2013, but the country has had challenges in generating new jobs for the growing size of the labor force. Though established as an upper middle income country by income per capita at $15,600, poverty and income disparity continue to be a persistent problem. By official estimates, 52.3% of Mexican’s are living below the national poverty line. Economic disparity is also a significant issue, 10% of the nation’s wealthiest individuals earn 37.5% of all income, compared with the lowest 10% earning 2%. Trade has provided significant benefits to the industrial sector of the Mexican economy, with industrial products contributing to the largest share of total export earnings. The automotive industry within Mexico is among the largest contributors to economic growth, with numerous international automotive companies engaging in production as well as research and development within Mexico. An export focused economy, Mexico is the largest importer and exporter in Latin America, and is one of the world’s leading exporters, $370.9 billion in 2013. Total imports in 2013 were estimated to be $370.7 billion, primarily of capital goods and machinery related to the automotive and agricultural industries. Mexico’s main import partners are the U.S. (49.9%), China (15.4%) and Japan (4.8%). The main export partner is the U.S. (78%). Metalworking machines, steel mill products, agricultural machinery, electrical equipment, car parts for assembly, repair parts for motor vehicles, aircraft and aircraft parts. Manufactured goods, oil and oil products, silver, fruits, vegetables, coffee, cotton. I signed up and ran my first Tough Mudder (*) event last July with five other teammates: two of them from France, one from Ireland, one from Egypt and one from Minnesota. I am glad to report that we were all able to complete the 11-mile long obstacle course, working as a team and that we had a tremendous amount of fun in the process! Three of us had never run the Tough Mudder and we did not have any special training to complete this event – besides the fact that four of us were middle-aged men working full-time jobs with little ones at home (best training ever in my mind!). However, we all wanted to challenge ourselves, put ourselves outside of our comfort zones and have a blast. My favorite obstacle was the Cage Crawl, where you “swim” under 20 meters of cage with only inches of breathing room above your head. This probably sounds a lot worse than what it was actually like: I felt like I was part of one of those Mission Impossible movies and that kept me going with a big smile on my face all the way to the end. My least favorite obstacle had to be the Arctic Enema where you dip into freezing water, have to swim through the ice, get under a wooden plank and pull yourself out on the other end. Although I did 3 Polar Plunges over the past 5 years, I never had to be submerged for more than a moment or two in ice-cold water. The Arctic Enema was definitely more challenging – but then again, it probably sounds worse than what it was actually like. (*) Tough Mudder is an endurance event series in which participants attempt 10 to 12-mile-long (16-19 km) military-style obstacle courses. Designed and created by British Special Forces to test mental as well as physical strength, obstacles often play on common human fears, such as fire, water, electricity and heights. The main principle of the Tough Mudder revolves around teamwork. The Tough Mudder organization values camaraderie throughout the course, designing obstacles that encourage group participation. Participants must commit to helping others complete the course, putting teammates before themselves, and overcoming fears. The events are untimed, and an average 78% of entrants successfully complete the course. The first Tough Mudder challenge was held in the United States in 2010. To date, more than 1.3 million people worldwide have participated in Tough Mudder events. Tough Mudder supports a charity in each territory it holds events (usually military-affiliated), and encourages participants to raise money to aid veterans. Current charities supported include Wounded Warrior Project (in the United States), Wounded Warriors Canada, Help for Heroes (in the United Kingdom), and Legacy (in Australia). U.S. participants have raised around $6.5 million total for the Wounded Warrior Project since Tough Mudder's inception in 2010. Canada Amends Customs Self-Assessment Program to include NRIs .